Common and contagious, Athlete’s foot is a fungal infection that can transform clean, healthy feet into itchy, flaky, scaly, burning messes in a short period of time. Typically, Athlete’s foot is transmitted at places where people walk barefoot, such as community pools, bathhouses and showers. Left untreated, skin blisters and cracks caused by Athlete’s foot can worsen into serious bacterial infections, even spreading to the groin area. 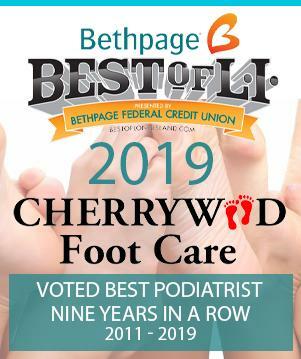 It’s nothing to ignore, as we know well at Cherrywood Foot Care. Our team of foot experts have been treating Athlete’s foot for nearly 30 years and know the best way to clear it up. Proper treatment of Athlete’s foot depends on the type and extent of the fungal infection, so it is important to consult us before choosing a therapy. Athlete’s foot can usually be treated with antifungal creams. Unfortunately, re-infection is common, so it is important to continue the therapy as prescribed, even if the fungus appears to have gone away. Lasting cases of Athlete’s foot may require foot soaks before applying antifungal creams. Severe infections that appear suddenly usually respond well to treatment. But toenail infections that develop with Athlete’s foot tend to be more difficult to cure than other fungal skin infections. Don’t mess around with Athlete’s foot. Cherrywood Foot Care can stop it before it worsens or spreads, no matter what level of severity.